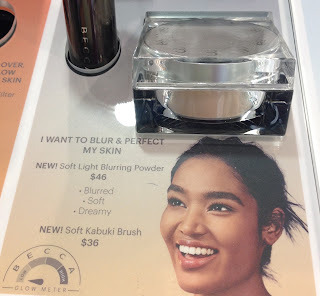 When I was at Sephora the other day I took a look at the new Becca Soft Light Blurring Powder that is out for spring. 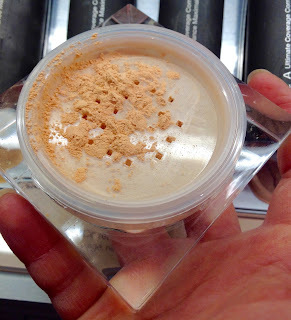 It's $38 USD or $46 CND, and it's a powder that is supposed to be a universally flattering shade named Golden Hour. The powder is supposed to blur imperfections, eliminate shine, add extra dimension to the face, and add a subtle radiance. It sounds counterintuitive to have it both eliminate shine and add it, but I suppose it's possible. The packaging on this powder is huge. I have small hands, but I did find this slightly difficult to get a grip around. It's a large transparent plastic rectangle with a slightly odd opening mechanism for the lid. You turn it side-ways than pull up, if you continue to turn it it will close again. The powder is a peach-gold colour that is finely milled and is dispensed through a sifter. It felt light-weight when I swatched it. On the skin the orange tint to the powder goes away leaving instead a lovely light gold. In the swatch above I layered the product a couple times so it could be seen in a photograph, but I think it could be lightly applied for an all-over glow. Just keep in mind it will be glowy- this definetly isn't as satin as their glow metre depicted on the display indicates. I think this product might be good if you're looking for a loose all-over glow or a less intense highlight shade. In purpose it reminded me of the Hourglass Ambient Lighting Powders- though I don't know how it would perform in comparison. 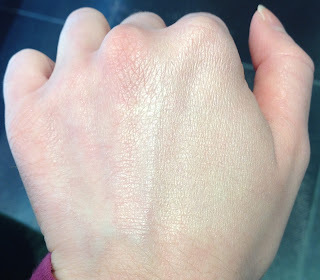 For me personally I liked the powder but I don't know if I'd like it all over my face- I might have to try that sometime to see if it really does blur imperfections, and to see how much glow it actually imparts there versus what my hand showed. Disclaimer: The widget at the top contains an affiliate link, and brings you to the page on Sephora. I get a whole 5 cents if you click it. Mainly though the picture is there so you can see a professional shot of the product.